The best compliment a small business can receive is a good review. Thank you to my wonderful clients for your kind words! "I wanted to send a note to point out how thrilled we are with the cane work. 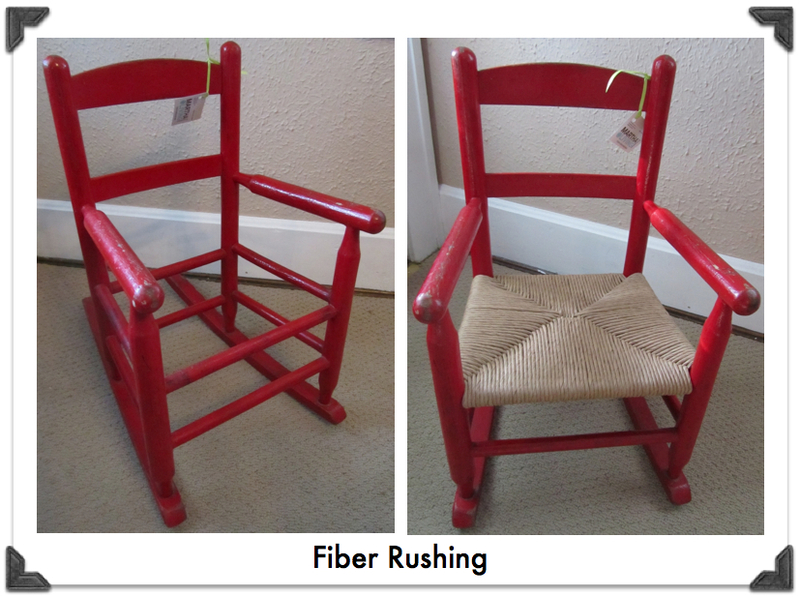 The finished rocker exceeded our expectations and we're ecstatic. I'd like to think my g-g-grandmother is smiling. " "You are very professional- the chair you fixed for us is perfect! Also, we would like to mention that you have been most kind, patient and timely. 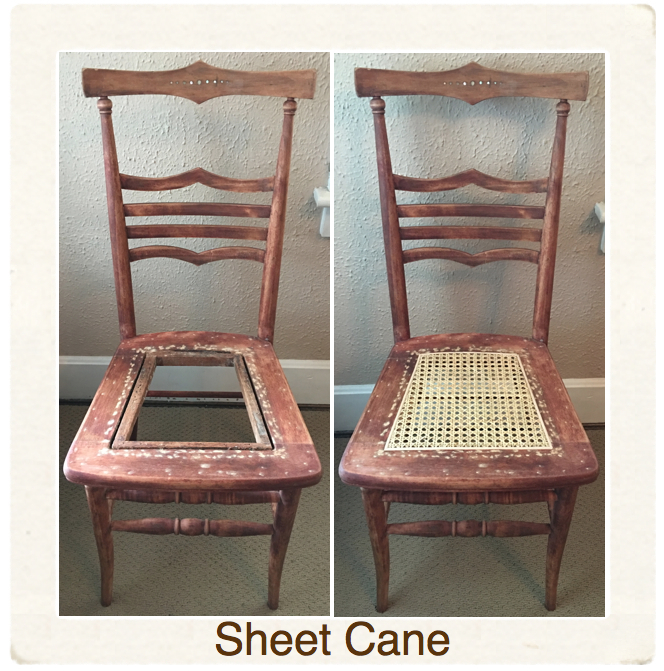 "Thanks so much for the beautiful job you did on caning our chair. And I also so appreciated the information you could provide on the detail and period of the piece. We will definitely pass your information on to others who have caning needs. It's wonderful to find a business such as yours in the area to whom we can trust our family pieces!" such specialized work and done in a timely manner." "We cannot thank you enough for the lovely job you did on our Wegner chairs – they are as good, if not better than the originals. We are enjoying our newly caned chair. I am so happy I found you to do the work for us. Good luck in the future. 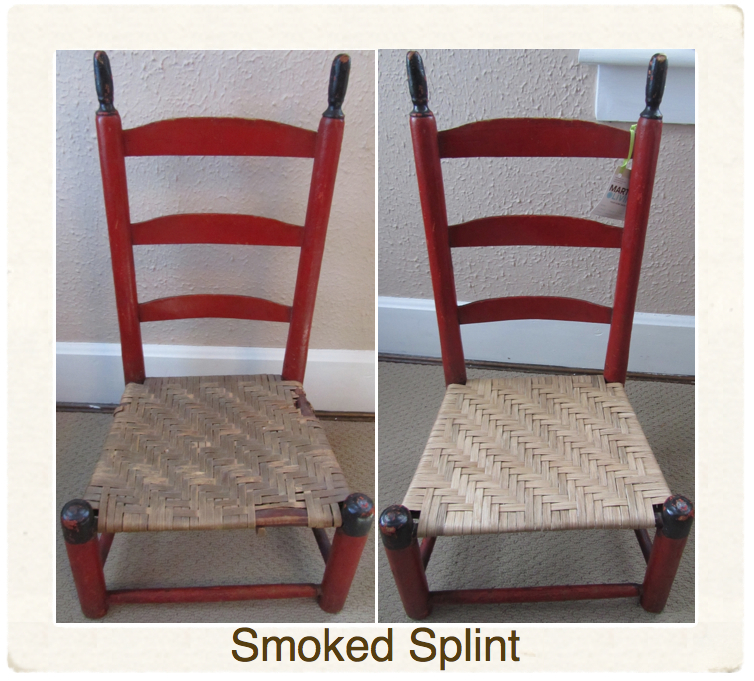 "She replaced a broken cane seat on an antique high chair and made a repair a splint weave seat on another chair. Member Comments: I brought her the chairs and she took about 2 weeks for the caning but repaired the splint seat on the spot so I didn't have to leave the chair. 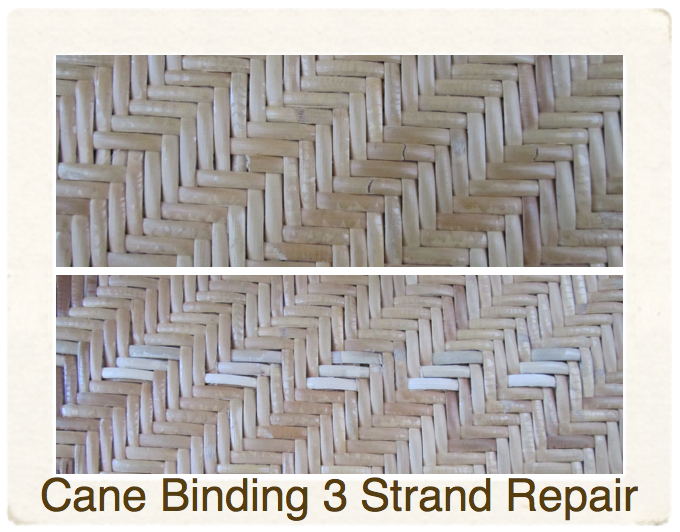 She did excellent work and I plan to reuse her again." "Great job on repairing a chair for me. Thanks so much. It should last a lifetime." 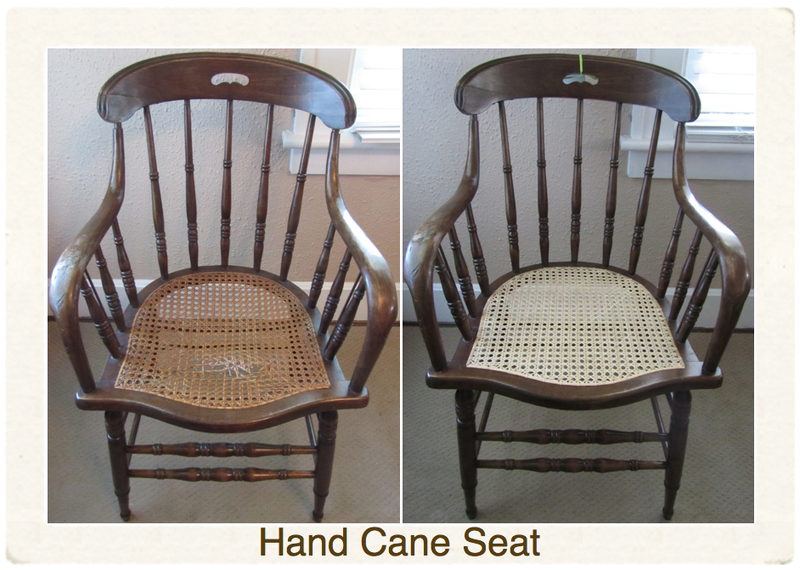 "You did such a fine job on the seat of our rocker. I can't wait for company to sit on it!" 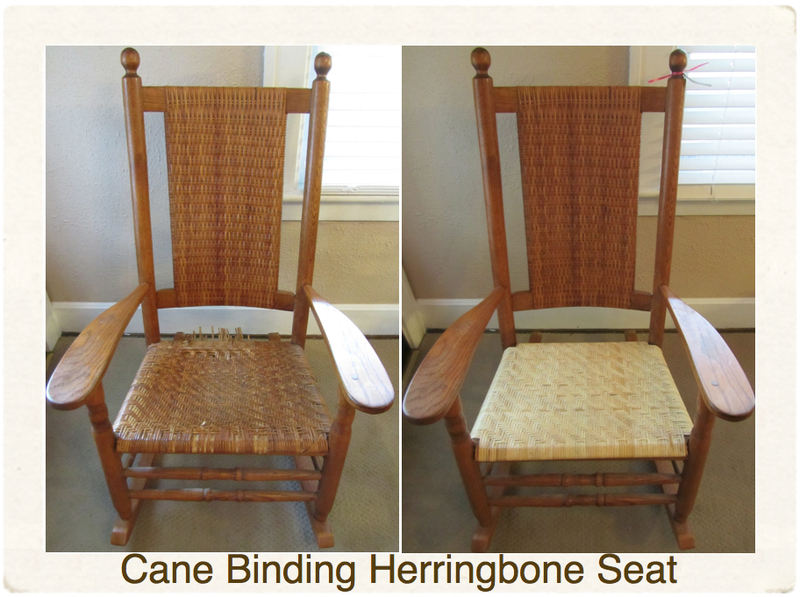 "Thank you so much for restoring the caning on my heirloom rocking chair. You did a beautiful job!! Pretty fast turnaround and you were a pleasure to meet!" 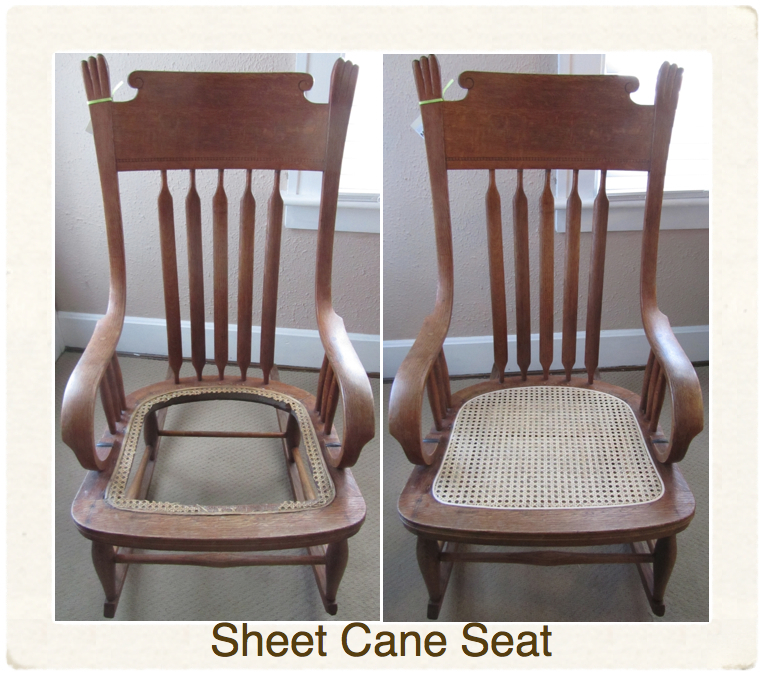 "Chair seats were very well done and work completed on time as estimated, and at price quoted. 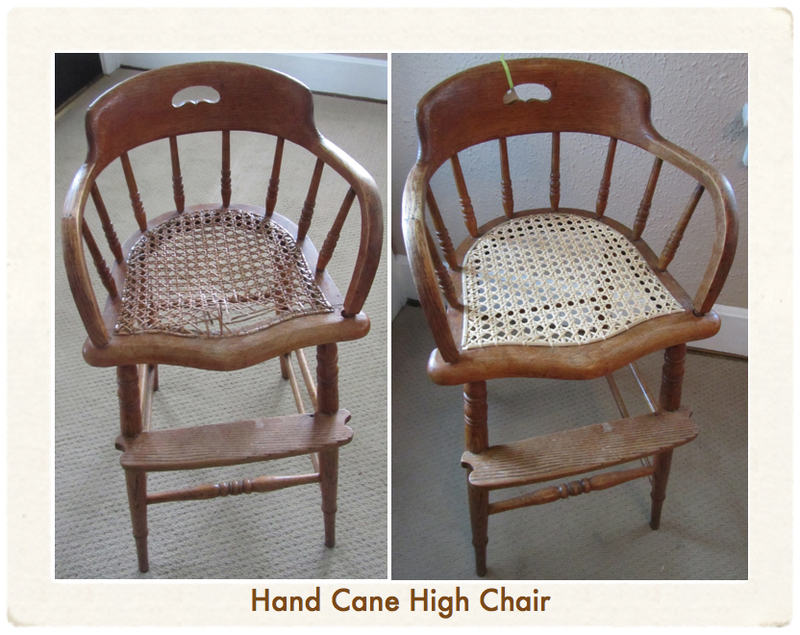 Also used Emza's Chair Caning with good results a year ago, for 2 additional chairs. (Total 5 chairs in all.)" "Thank you Emza, I am looking forward to fifty years of rocking in the chair!" "Emza's work is high quality, fine craftsmanship. She re-caned a captain's chair for us, and it is beautiful. 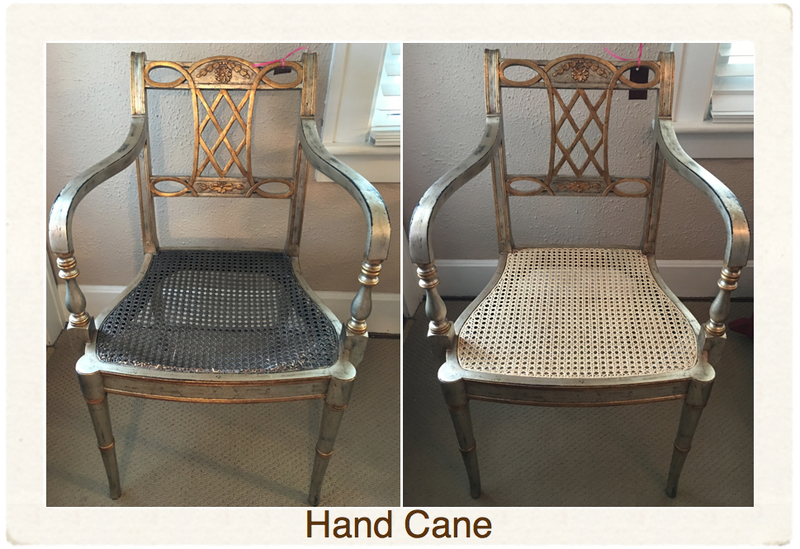 We are very pleased to have the chair restored to its intended beauty and function. Thank you Emza." 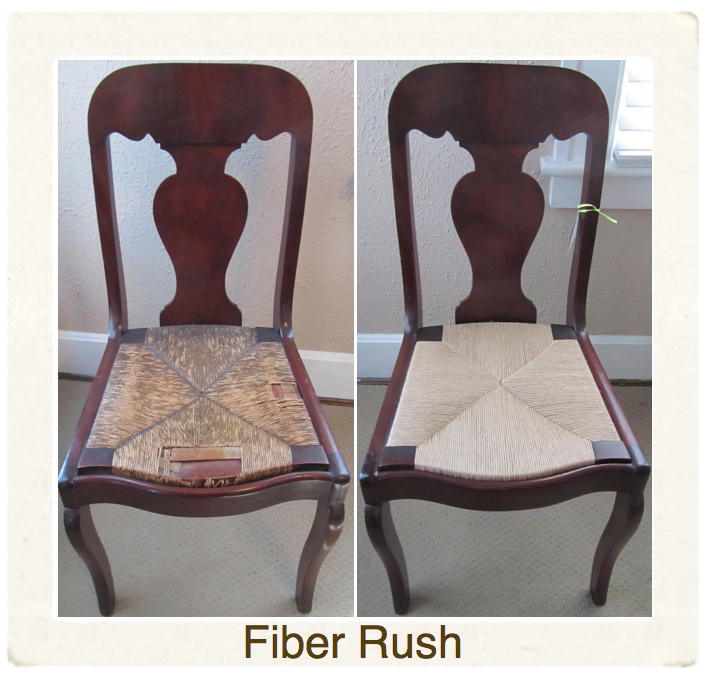 "Beautiful work on my family chair. Emza carefully removed the old seat and saved it for me. It has special memories because it was done by my mother when I was a small child. I intend to frame it." "Thanks again--I think the chair is BETTER than new!" "The chair looks really good. Thanks for the nice job. I am certain my sister will really like it." "I wanted to let you know how beautiful my chair looks. I'm so glad I found you and appreciate your work". "Thank you SO much!!! You do fantastic work!" "And my sincere thanks to you Emza. 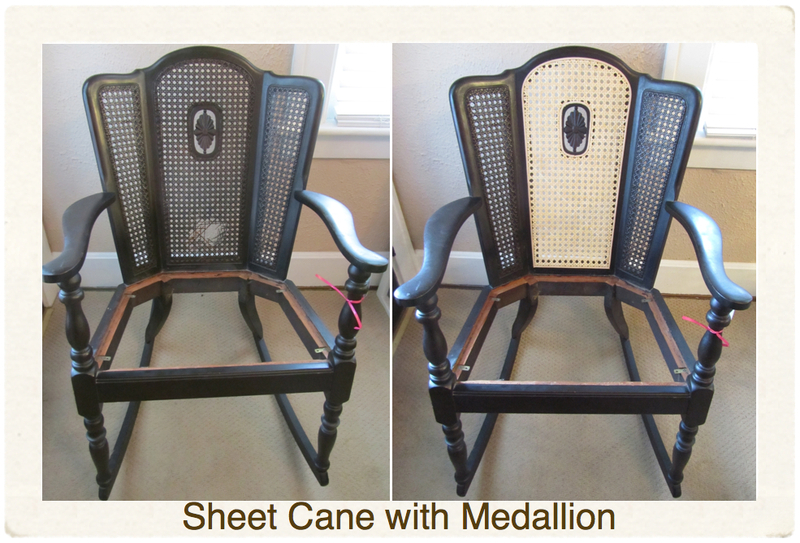 I love my chair and am thrilled to have it back in its place with its match!" "The seat arrived today. I am so amazed at the work you have done. I never thought I would be able to get this little stool that I love so much repaired and thought it would be a total loss. I am so glad I found you. 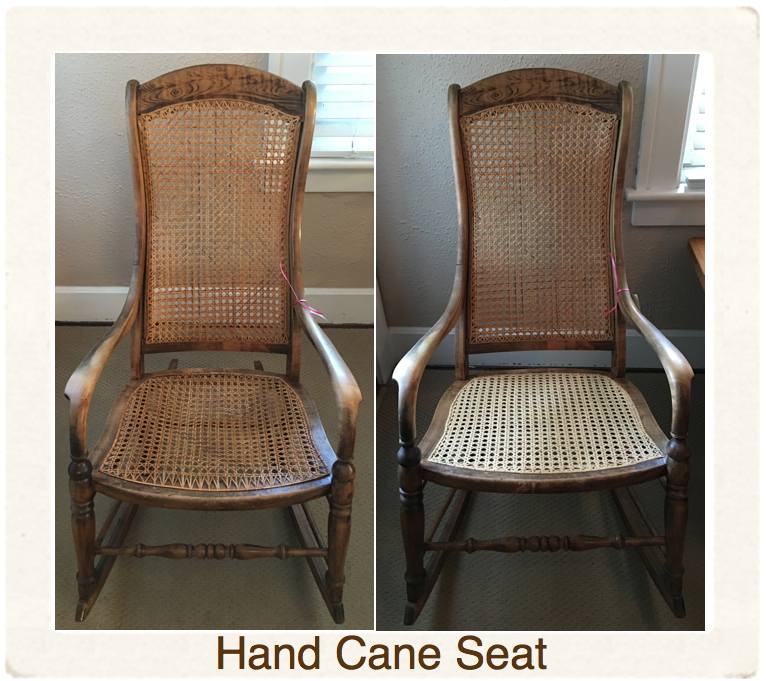 It is absolutely beautiful – it looks like a brand new chair!! If I ever have the opportunity to recommend you, I most surely will. Thank you so much for your time and skills!" "Many thanks, Emza, for recently caning the bottom of my rocker gifted to me by my mother many years ago. You did an excellent and timely job with much love. I couldn’t recommend you and your services more highly. Thanks again, Mike"
"We are very pleased with our chair and highly recommend your work. Thanks!" Thank you for the good job you did on my chairs. That was my Dad's "hobby" after he had retired and went to a lot of auctions. He gave me a rocker that he had repaired. He was known as the "Chair-man." "As a folklorist, I was delighted to learn about caning from someone who has a history of caning in her family. I had tried two or three times to find someone who could do a good job for me here in Columbus, but until I found Emza was very disappointed with the work. It is really specialized!! 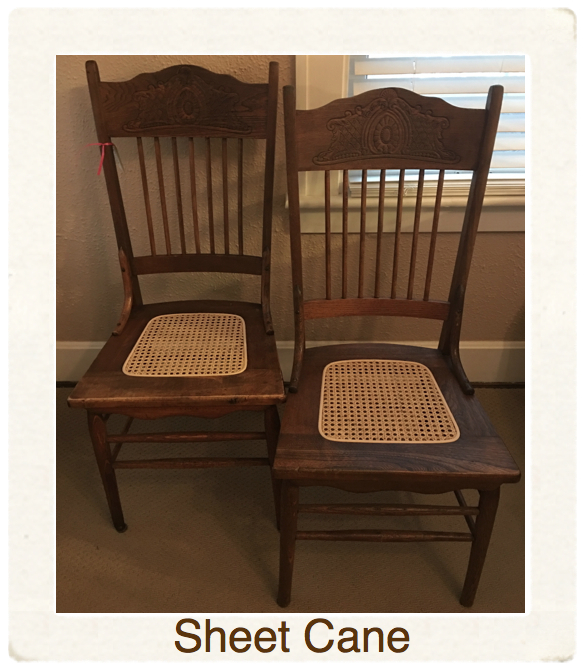 Yesterday when I got my chairs, she explained the history of the antique chair including special "new" techniques for bending the wood and information about the company that made the chair (showed me the maker's mark) and about when it was made. I started taking notes. Why not? 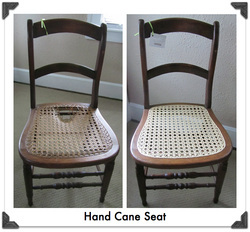 With the 1980s chairs, she took it upon herself to remove the unbroken chair seat from one chair to put with the unbroken back caning on another so that the cane that had nicely aged would match. I didn't even think of that, and it was an extra step for her. This thoughtfulness seems to illustrate her creativeness and her love for her craft." 'Emza is great to deal with- explains everything clearly. She is professional and helpful.'" 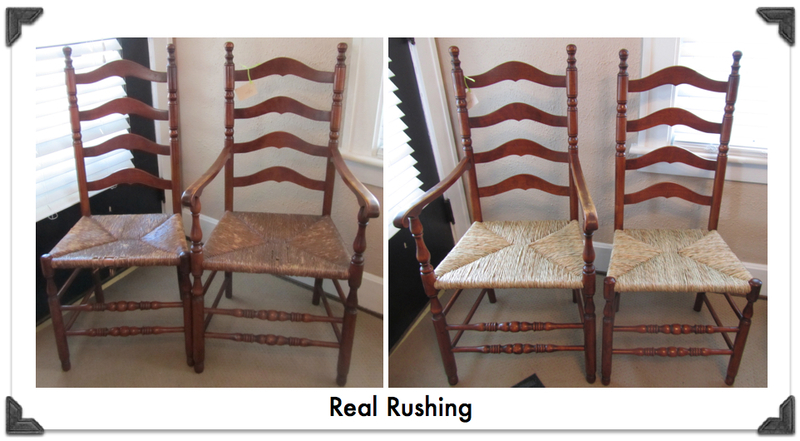 "Beautiful natural rushing applied to 5 dining chairs- they look fantastic, sturdy and elegant. Great attention to detail and such a nice person to deal with. She completed the chairs as scheduled and was very helpful during the planning phase with selection of material and options. Very competent and skilled at her craft. She has my highest recommendation for quality and no hidden costs- all presented up front. A++++++"
"Thank you so much for replacing the seat of my mother's childhood rocker. It has withstood several generations with a not-so-pretty seat made from woven strips of tire innertubing. It now has the most beautiful finished seat of it's 80 year life and I know it will be enjoyed by my grandson and generations to come. Thanks, again." 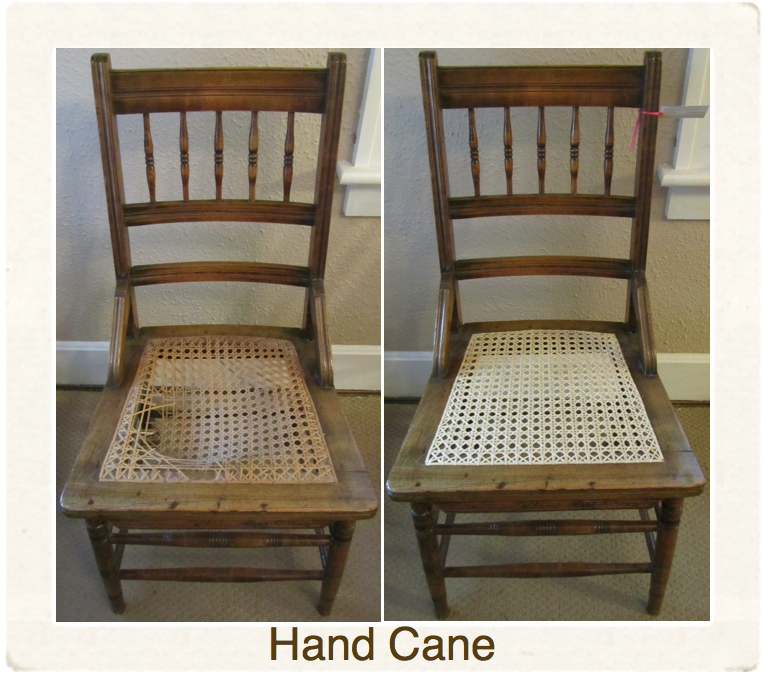 "Emza saved my grandmother's dining room chairs. I remember sitting on these as a little girl. Now that they are beautifully rushed, my grandchildren will use these! Thanks, Emza!" 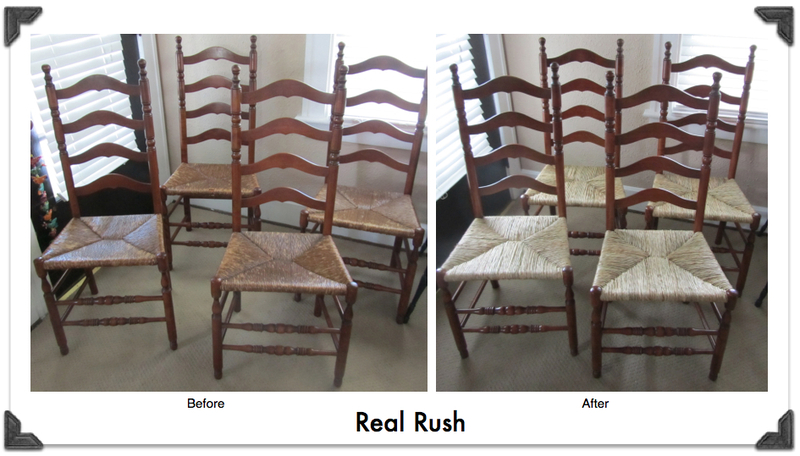 "We had Emza's Chair Caning reseat a pair of bar stools with real rush and she did stunning work! We are thrilled with the one-of-a-kind, quality pieces we now have at our kitchen island. She was great to work with, sent us samples of the materials so we could select what we wanted, and followed up after we had the furniture in our home. Thank you!!"